The first quarter of 2019 has flown by and the Dubai real estate market has seen interesting developments over the last three months. 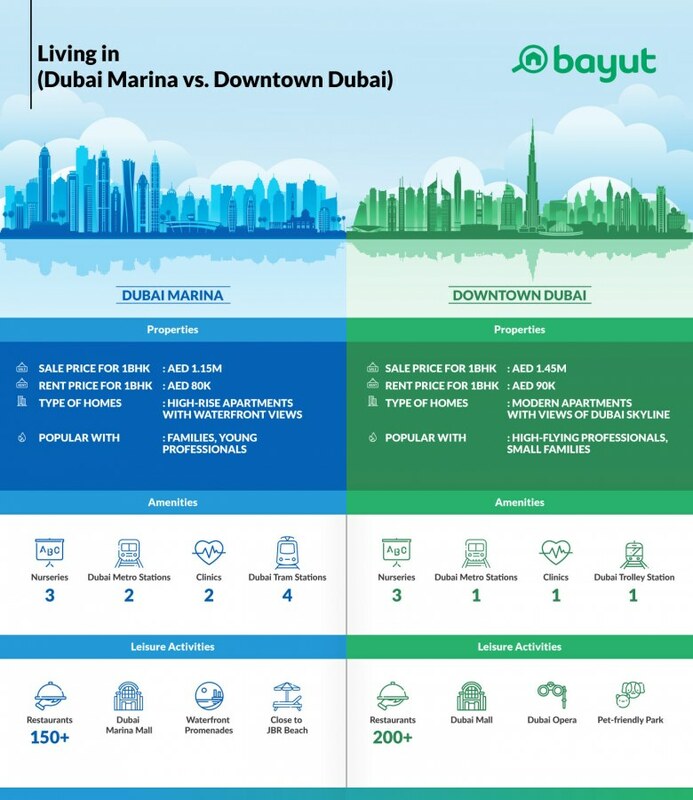 Bayut has compiled an in-depth report on the property market in Dubai, which explores price trends for buying and renting apartments and villas in the city’s most popular areas. To do so, we’ve compared property prices in Dubai in Q1 2019 to prices from Q4 2018. According to property trends in Dubai, interest has remained high for luxury areas in the city, especially in the wake of attractive prices. These include long-time favourites such as Dubai Marina, Downtown Dubai and Palm Jumeirah, all of which feature amongst the top 10 areas for buying and renting. 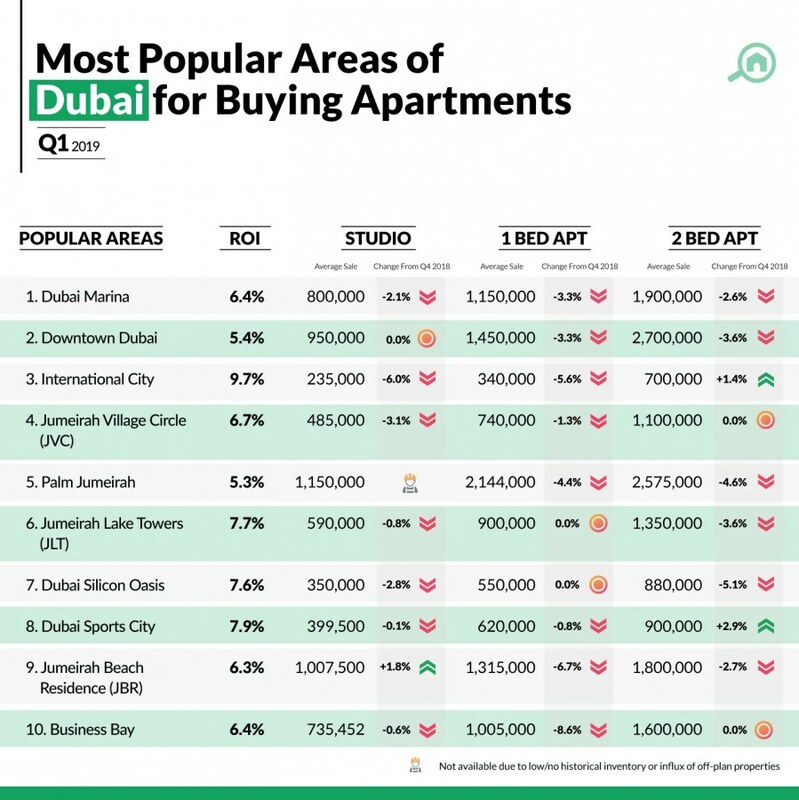 Interestingly, suburban areas like Dubai Silicon Oasis and Jumeirah Village Circle are being more sought after by investors and renters alike. Overall, Dubai real estate price trends reveal a decrease in sales and rental prices since Q4 2018, however, the changes have remained marginal. Popular areas like Dubai Marina, Arabian Ranches and Mirdif have even seen rental prices stabilising for certain units in Q1 2019. While from an investment perspective, prices are seeing an upswing for certain units in affordable communities like International City and Dubai Sports City. Read on to discover how property prices in Dubai have fared over the first three months of 2019! Following the same trend as 2018, Dubai Marina and Downtown Dubai still hold strong as the most popular areas with apartments for sale in Dubai. Both areas have seen minor decreases across prices for most units. The most significant price changes for apartments in Dubai Marina is for 1-bedroom units, where prices have fallen by 3.3%, dipping from AED 1.19M to AED 1.15M in Q1 2019. Meanwhile, the most notable price drop in Downtown Dubai is for 2-bedroom units. Investors can expect to shell out an average price of AED 2.7M when buying 2-bedroom apartments in Downtown Dubai. According to Dubai property market trends, apartments for sale in Marina Diamonds are the most popular in the area of Dubai Marina, while in Downtown Dubai, potential investors are most keen about the apartments in Burj Khalifa. Retaining its position since 2018, International City was the third-most searched area for apartment sales in Dubai. The price changes for apartments in International City have been modest with studios and 1-bedroom units averaging at AED 235k and AED 340k respectively. However, prices for buying 2-bedroom apartments in International City have risen by 1.4%, increasing from AED 690k in Q4 2018 to AED 700k in Q1 2019. A similar trend has also been noticed in other affordable areas like Dubai Sports City, where 2-bedroom units have seen prices jump from AED 875k to AED 900k now. While property prices in Dubai have decreased over the last quarter, the changes have been modest. Other areas with apartments for sale that are sought after by investors in Q1 2019 are Palm Jumeirah, Jumeirah Lake Towers, Dubai Silicon Oasis and Dubai Sports City, with all areas seeing prices decline between 2% – 5%. According to property price trends in Dubai, the affordable apartments for sale in International City continue to boast the best rental returns in Dubai for Q1 2019. Investors can expect an impressive average ROI of 9.7% in International City when buying properties in Dubai to rent out. It’s followed by Dubai Sports City, where the apartments deliver a strong ROI of 7.9%. Other areas from the Dubai real estate market 2019 that have the best rental returns include Jumeirah Lakes Towers (7.7%), Dubai Silicon Oasis (7.6%) and Jumeirah Village Circle (6.7%). Property trends in Dubai for Q1 2019 reveal that Dubai Marina bounces back as the prime choice for renting apartments in Dubai. Property prices in Dubai Marina appear to have largely bottomed out, with studios and 1-bedroom units staying stable in Q1 2019. However, rental prices for 2-bedroom apartments in Dubai Marina have fallen from AED 120k to AED 115k. The apartments for rent in Marina Pinnacle are the most popular with potential tenants looking to live in Dubai Marina. 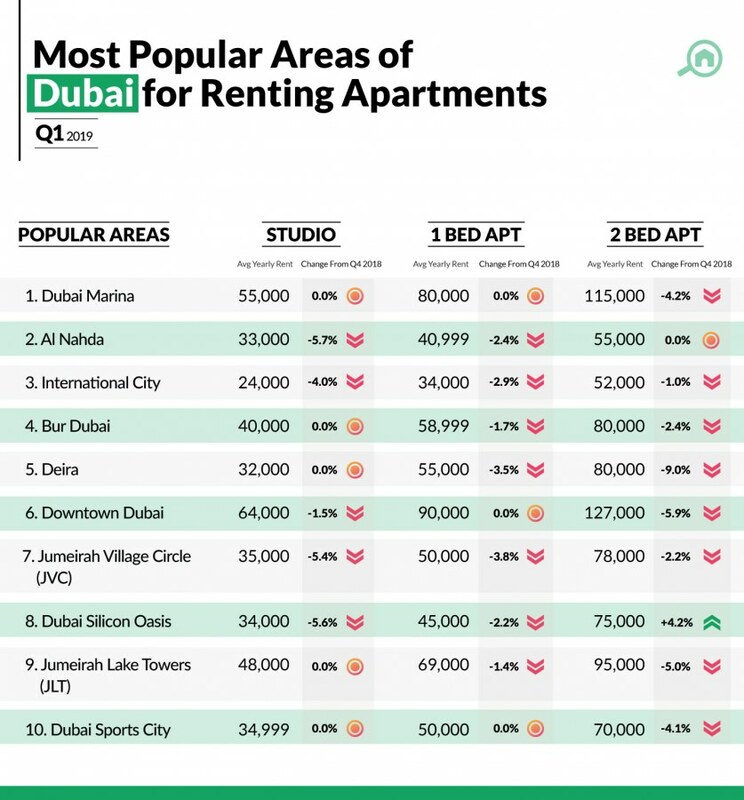 In Q1 2019, Al Nahda is pushed down to second place for renting apartments in Dubai. Property price trends in Dubai show that studios and 1-bedroom units have seen rent prices drop to AED 33k and AED 40.9k in Q1 2019, while 2-bedroom units remain steady at AED 55k. The budget-friendly neighbourhood of International City also features amongst the top places with apartments for rent in Dubai. International City has been attracting significant attention from renters for the area’s affordability, an abundance of everyday amenities and strategic location off Sheikh Mohammed Bin Zayed Road. Price changes for the apartments for rent in International City have been between 1% – 4%. Studios, 1 and 2-bedroom apartments here have average rental prices of AED 24k, AED 34k and AED 52k respectively. Other areas that have attracted attention from potential tenants include Bur Dubai, Deira, Jumeirah Lake Towers and Dubai Sports City. Bayut’s report on property prices in Dubai shows that these areas have experienced price changes between 1.5% – 6% for rental apartments, with the exception of Deira. The prices for renting 2-bedroom units in Deira have dipped by 9% in Q1 2019, dropping from AED 90k to AED 80k. For those looking at investing in or renting luxury apartments in Dubai, the areas of Dubai Marina and Downtown Dubai are strong contenders. Both these upscale areas have made their mark in the Dubai real estate market and boast their own advantages. From an investment perspective, the average price for buying apartments in Dubai Marina is relatively more affordable. For instance, the average buying price for 1-bedroom apartments in Dubai Marina is AED 1.15M, while sales prices for the same in Downtown Dubai averages at a pricier AED 1.45M. The ROI for apartments in Dubai Marina stands at a strong 6.4%, higher than Downtown Dubai’s ROI of 5.4%. However, end-users should consider the advantage of Downtown Dubai’s central location with easy access to commercial districts like Business Bay, Dubai International Financial Centre and more, which gives the area strong investment potential. For luxury apartment rentals in the Dubai property market, Dubai Marina still has the advantage of more affordable prices, with 1-bedroom apartments for rent averaging AED 80k in Q1 2019. Meanwhile, trends for Dubai property prices show that average prices for renting 1-bedroom units in Downtown Dubai stand at a slightly higher AED 90k. Dubai Marina has remained a strong favourite for renting apartments in the city, boasting nurseries, connectivity, entertainment options and nearby beaches. However, Downtown Dubai’s proximity to major attractions like Burj Khalifa and Dubai Opera, nightlife scene and a pet-friendly park has made it a prime choice for single professionals. As seen in Dubai real estate market trends, apartments in suburban areas like Jumeirah Village Circle (JVC) and Dubai Silicon Oasis (DSO) are rising in popularity with investors and renters for their affordability and convenient lifestyle. However, DSO wins in terms of affordability; 2-bedroom apartments for sale in Dubai Silicon Oasis will set investors back by AED 880k, while renting the same costs an average price of AED 75k. However, investors can expect to shell out AED 1.1M to buy 2-bedroom apartments in JVC, while renters will only pay a slightly higher price of AED 78k for 2-bedroom units in the area. DSO offers a wealth of everyday amenities to residents including schools, supermarkets and clinics. Its location just off Sheikh Mohammed Bin Zayed Road also guarantees connectivity to commercial and entertainment hubs of Dubai. Property prices in Dubai show that the apartments in DSO also deliver a higher ROI of 7.6%, compared to 6.7% in JVC. However, JVC boasts a community vibe that may not be found in DSO, with an abundance of parks, bicycle and walking paths. JVC is also located closer to the heart of New Dubai, near other residential communities and boasts easy access to Al Khail Road and Sheikh Mohammed Bin Zayed Road. Predictably, the upscale community of Arabian Ranches has topped the list of popular areas to buy villas in Dubai. Sales prices here have seen modest decreases across 3-bedroom and 5-bedroom units, while 4-bedroom units have remained steady at AED 3.8M. Al Reem is the most popular sub-community to buy villas in Arabian Ranches, drawing in an overwhelming 47.9% of the complete searches. The luxurious villas in Palm Jumeirah have seen prices largely bottom out over Q1 2019. The prices to buy 3-bedroom villas in Palm Jumeirah have remained stable at AED 6.19M, while 4-bedroom units have dipped slightly from AED 10.2M to AED 9.8M over the last quarter. However, the larger units of 5-bedroom villas in Palm Jumeirah have seen prices take an upswing, raising sales prices from AED 16M to AED 16.5M now. The villas for sale in Dubailand attract high interest from investors due to the mix of affordable and luxury properties available. The prices for 3-bedroom units for sale in Dubailand have fallen by 6.9%, from AED 1.45M to AED 1.35M, while 4 and 5-bedroom villas stand at AED 1.99M and AED 2.89M respectively. The Villa, The Springs, Mudon, Arabian Ranches 2, DAMAC Hills and The Meadows were other areas that are sought after by investors looking at villas for sale in Dubai. Current property prices in Dubai reveal that price changes in these areas have largely been modest and between 1% – 7%. The only exception to this are 4-bedroom units in DAMAC Hills and The Springs. These units dropped from AED 2.88M to AED 2.6M in DAMAC Hills and from AED 2.9M to AED 2.67M in The Springs in Q1 2019. Property trends for the Dubai real estate market 2019 show that the exclusive community of Emirates Hills is garnering a lot of interest from high-profile investors. 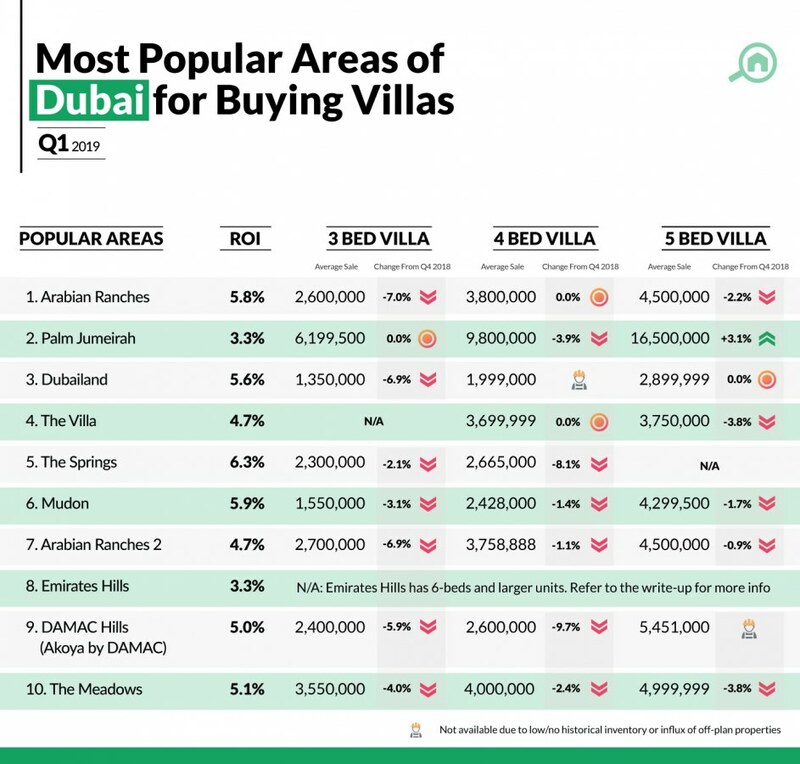 Home to sprawling, luxurious properties, 6-bedroom villas in Emirates Hills are the most popular with buying prices going up by 3.4%, from AED 29.9M to AED 31M in Q1 2019. This is followed by 4 and 7-bedroom villas in Emirates Hills that average at AED 17M and AED 44.4M in Q1 2019. For investors looking at buy-to-let properties in Dubai, the villas in The Springs are an excellent option. According to Bayut’s report on property prices in Dubai, The Springs’ villas have an average ROI of 6.3% in Q1 2019, the highest for any villa community in the city. The second-highest ROI for villas in Dubai is found in Mudon at 5.9%. Other villa communities with the best rental yields in Dubai include Arabian Ranches (5.8%), Dubailand (5.6%) and The Meadows (5.1%). In Q1 2019, the suburban neighbourhood of Mirdif ranks as the most popular area with villas for rent in Dubai. The area is home to long-time expat and local residents, who enjoy Mirdif’s peaceful surroundings and abundant amenities. The high interest in the area is reflected in Mirdif’s mostly stable prices, with 3 and 4-bedroom villas for rent in Mirdif experiencing no change and standing at AED 105k and AED 120k. Only 5-bedroom units have seen prices decrease by 6.7% in Q1 2019, taking prices from AED 142k to AED 132.5k. 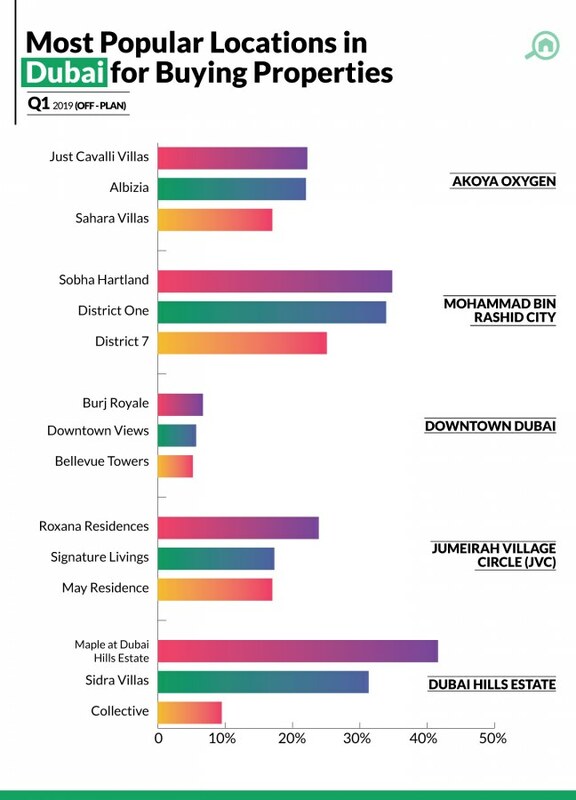 Uptown Mirdif was by far the most popular sub-community with renters looking to live in villas in Mirdif. Similar to investors, Arabian Ranches is also a favourite with renters with prices remaining steady across the board in the first quarter of 2019. Property prices trends in Dubai show that rentals for Arabian Ranches average at AED 145k for 3-bedroom units, AED 220k for 4-bedroom units and AED 250k for 5-bedroom units. 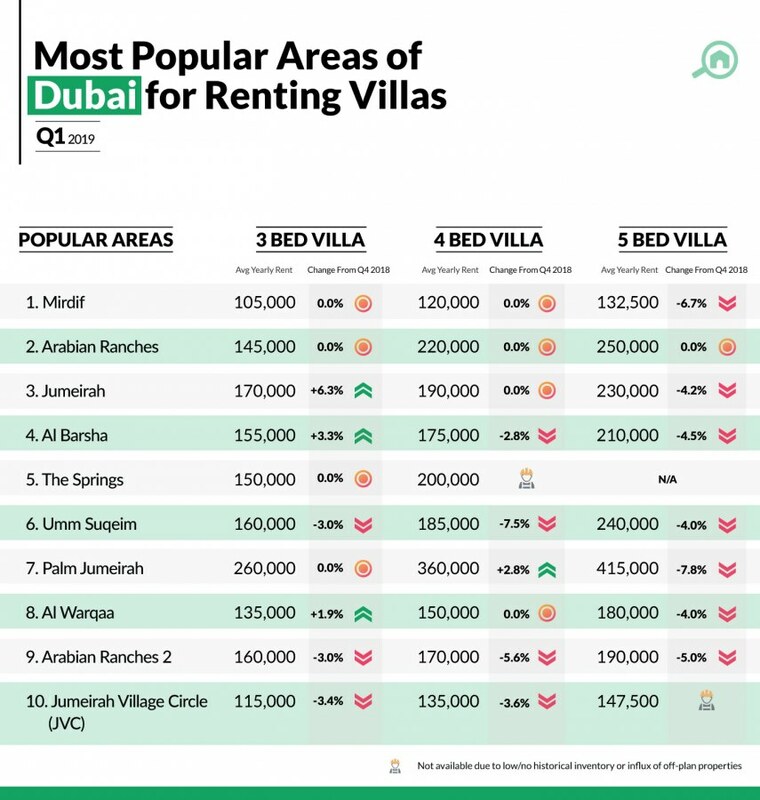 Other established areas like Jumeirah and Al Barsha were also among top choices to rent villas in Dubai, according to property trends in Dubai. According to Dubai real estate market reports, prices for 3-bedroom units in both areas have witnessed an uptick, rising from AED 160k to AED 170k in Jumeirah, and from AED 150k to AED 155k in Al Barsha. Any price decreases in both areas were under the 5% mark. Other locations that attracted attention from renters for villas in Dubai are The Springs, Umm Suqeim, Palm Jumeirah and Al Warqaa and Arabian Ranches 2 and Jumeirah Village Circle. Property price trends in Dubai reveal that these popular areas saw modest declines, mostly under 8%. The only exceptions were Palm Jumeirah and Al Warqaa, where prices increased for certain units over Q1 2019. Renters will find that prices for 4-bedroom villas in Palm Jumeirah have risen from AED 349k to AED 360k, while rental prices for 3-bedroom villas in Al Warqaa have gone up from AED 132.5k to AED 135k. For residents looking to upgrade to villas, Dubai property market trends reveal that Arabian Ranches and The Springs are amongst the top choices. For investors, The Springs is the more reasonably-priced area as buying a 3-bedroom villa here costs an average of AED 2.3M, while the same in Arabian Ranches stands at AED 2.6M. Interestingly, in Q1 2019, prices for renting 3-bedroom villas in The Springs stand at AED 150k, while the same unit in Arabian Ranches averages at a lower price of AED 145k. Consequently, the villas for sale in The Springs also have a higher ROI of 6.3%, while villas in Arabian Ranches deliver rental yields of 5.8%. The higher sales prices in Arabian Ranches community are explained by the more spacious, independent villas, lush golf course and surroundings and abundant amenities. However, The Springs area has the advantage of being more centrally located with easy access to Sheikh Zayed Road and Al Khail Road, and the amenities of nearby communities of The Meadows and The Lakes. 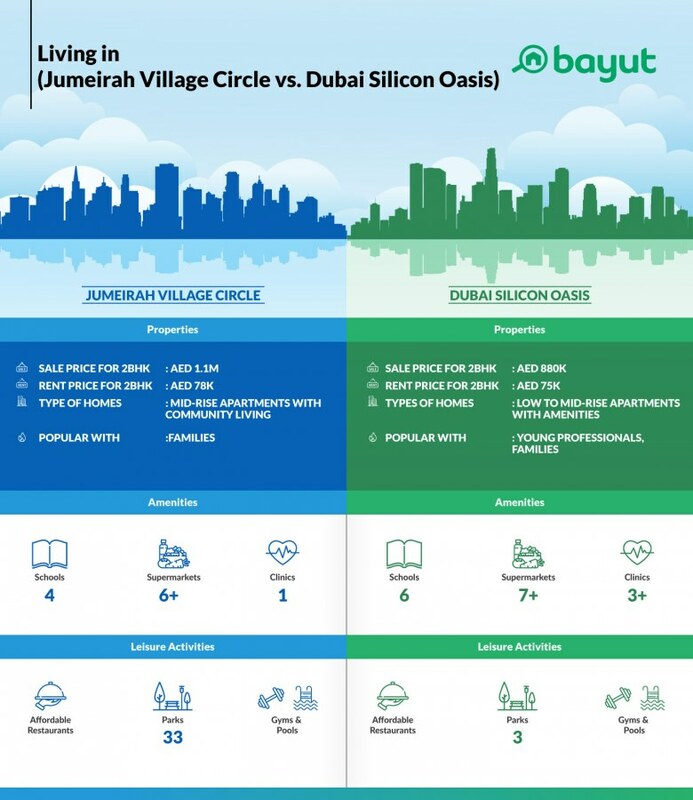 Bayut’s Dubai property market report shows that Akoya Oxygen is the new favourite amongst investors for off-plan developments in Dubai real estate market. Situated off the Expo Road, Akoya Oxygen by DAMAC Properties is generating significant interest for its luxury villas and golf course. The flexible payment plans for buying off-plan villas in Akoya Oxygen has also likely widened the investor pool, attracting buyers who may not have previously considered investing in Dubai real estate. Within Akoya Oxygen, the upscale Just Cavalli Villas is the most popular with investors looking to buy off-plan villas in Dubai, garnering 22.2% of the overall searches. The sales prices for villas in Just Cavalli Villas start from AED 1.1M, according to Bayut’s current listings. Other popular off-plan developments in Dubai for Q1 2019 include the well-known areas of Mohammed Bin Rashid City and Downtown Dubai. Within these areas, Sobha Hartland (34.8%) in MBR City and Burj Royale (74%) in Downtown Dubai are most sought-after by investors. Jumeirah Village Circle and Dubai Hills Estate round up the other popular areas for off-plan projects in Dubai for this quarter.